Well, it was looking like a complete shut out from my last Battle of the Bands episode between the accoustic rock band Annie In The Water and a group tentatively known as BLACK EAGLES JAZZ BAND; but some generous voters chimed in at the last moment to save the contender. Final score was: Annie In The Water 18, Black Eagles 5. I apologize about the confusion with the original RUSTED ROOT and BLACK EAGLE JAZZ BAND sounding the same. I had thought so myself, but there were enough differences in style for me to have reasonable doubt. Ah well, I must say I did like the Black Eagles version better than the original video, and it was still a good competitor for AITW, despite the weird name. Who can say why a group picks a name sometimes. Rusted Root isn't that much better, lol. Anyway, I'm outa here for the next couple weeks to do some reading and book reviews. Maybe some of the reviews will land on the blog in the near future. See y'all on July 1 for IWSG. I Almost did not post for today's Battle of the Bands, hosted by DfensDogG Stephen T. McCarthy and the woodland nymph Far Away Series. Its hot and windy, I only have a swamp cooler, and my computer is hating all the damp, dusty air. Keys sticking, aphids coming in during the evenings for the glowing light, cat leaving hair everywhere, my wine tasting of hairy-dust and getting warm too quickly. My hands sweating and smudging everything. Enough to make me want to take a long break. Soon. My head feels all stuffed with damp fluff, and everything I came up with for the second post in the Dads, Grads, and Grooms theme for June limply fizzled away. I kinda started a love song to counter the RUN advice; I'm a glass-half-empty girl, so gotta get that negativity out of the way before clawing upward to bliss. Somehow love and romance seemed too radically opposite, even though it perfectly fits for dads and grooms who stick it out. Nearly despairing of finding a song for today, I discovered Rusted Root, Send Me On My Way on a list of top songs for graduates. Seems to fit for the adventures into the future for marriage and fatherhood too. So . . The lyrics were written by Rusted Root frontman Michael Glabiki, and several members of the band contributed musical tracks. A rough version of the song appeared on their Cruel Sun album released in 1992, and a cleaner version on their 1994 album When I Woke. The nonsensical lyrics are attributed to a general "happiness" feeling in the studio during the song's impromptu creation. The single (1995) made it to #72 on Billboard's Hot 100, and Send Me On My Way has made its notable appearances at commencement ceremonies and as part of a soundtrack for multiple children's movies as Matilda and Ice Age; and was used as the soundtrack for the coming of age tv drama series Party Of Five. Its highest honor, however, is that NASA used the song as wake-up music on the Mars Exploration Rover Opportunity, for Sol 21. Despite the song's wide media usage, I found no covers for the upbeat little ditty. Nope, none. Unless you count a few garage-band type productions and karaoke recordings. The contenders for today's Battle of the Bands feature are quite a step up from garage band, however, but were nearly impossible to find. Please welcome to the stage The Black Eagle jazz band and a group known all over the North East as Annie in the Water. Copied From their website: The Black Eagle's is have been a fixture on the international jazz scene since 1971, bringing the sounds of traditional New Orleans Jazz to audiences all over the world, for more than 40 years! Many observers regard us as the premier band playing in the traditional jazz style; we do regard ourselves as the "Keepers of the Flame”. If you like the uplifting and soulful music of New Orleans you'll love the sound of the New Black Eagle Jazz Band. The band has delighted audiences all over the world with their huge and eclectic repertoire of jazz from the 1920's and 30's. The group has a mature mastery of this great American music- from Louis Armstrong and Jelly Roll Morton to early Duke Ellington to Cole Porter; from blues to rags to popular songs of the era. The band has performed extensively all across North America, and has toured throughout Europe countless times. They have performed in New Orleans, London, Edinburgh, Belfast and Toronto to name a few. In 2011 they opened the Newport Jazz Festival to a packed house. They have been featured in concert with many jazz legends including Doc Cheatham, "Kid" Thomas, Benny Waters, Odetta and Milt Hinton, and with symphony orchestras - the Boston Pops, the Scottish National Orchestra , the Baltimore Symphony to name a few. The band has released over 40 recordings (including the Grammy-nominated "On the River") and videos. Their music has been featured in Ken Burns' documentaries and on NPR Radio. The band has also been a guest on The Prairie Home Companion show. Copied From their website: Annie in the Water is a high-energy Acoustic/electric jam group that blends Rock, Reggae, Funk, Groove, Blues, Hip-Hop and Bluegrass to deliver a unique sound and an unforgettable performance. With a multitude of genres, exclusive electronic tones and elaborate looping, Annie in the Water has bridged a fan base between young and old. What is really special is the group’s ability to play to any atmosphere whether it be a festival, bar, venue, private party, wedding or dinner music. Beginning in 2008, with every performance the band’s presence adapts and the sound evolves, creating a blend of music and entertainment that is both inspired by and tailored to the audience. Dynamic originals combined with the ability to render current hits and classic tunes in their own creative style are elements that contribute to the perpetual fun atmosphere and great vibes that can’t be duplicated anywhere else. What keeps fans coming back is the excitement of knowing that something different will happen every show since the group likes to incorporate songs within songs and mix-match beatbox with freestyle jams and lyrics. Not only does Annie in the Water possess the ability to perform a highly entertaining show, but they also maintain a high level of professionalism at all times. When it’s time to work, nothing else matters and that is why their popularity not only grows with fans, but with venues and promoters as well. Their social media network provides quantitative proof that Annie in the Water’s sound resonates across the nation and that their fan base spans worldwide… This is only the beginning. Ok, you know the drill; lets vote for your favorite contender (or least disliked) in the comments. Remember, the contest is between THE BLACK EAGLES and ANNIE IN THE WATER. If you would like to visit a list of more Battle of the Bands participants, visit the fearless Saint Mac. Stay cool, and keep tapping those toes!! 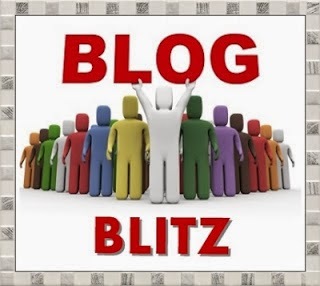 I welcome Jacquie Biggar to the blog today. Jacquie owned and operated a restaurant in her hometown of Edson, Alberta for thirteen years before moving west to Victoria to take care of her grandson and pursue her dream of becoming a writer. 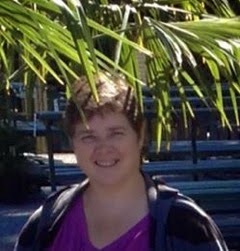 She joined Romance Writers of America, Kiss of Death—an online suspense group, and her local group, VIRA, Vancouver Island Romance Authors. From the time I was twelve years old, I knew I wanted to be a writer. That year I wrote a short story called Count Daffodil after spending countless hours in a desperate search for ideas. The story garnered me an A and was read aloud through the school's loudspeaker system. Needless to say, after that I was hooked. I grew up, got married, raised a family and left my writing urges to simmer in the background unattended. I owned and operated a successful diner in my hometown for a number of wonderful years before deciding to live my dream of becoming an author. My first book, Tidal Falls, a romantic suspense novel about second chances, released September of 2014. Not long at all, I’m still a relative newbie. I joined RWA-Romance Writers of America, in 2013. First thing I did after that was sign up for as many writing related classes as I could find. RWA is a haven for romance authors. They have a terrific support network and many forums to guide an author along the path, whether traditional or self-publishing. 3. What advice would you give a new writer just starting out? Don’t be afraid to ask advice. But, and here’s the caveat, stand up for what you believe in. No one can know your story like you do, so if they’re calling for a major overhaul I’d seek more opinions before doing anything else. Also, save, save, save. There’s nothing worse than working for hours on your project only to lose it all with some computer glitch. I recommend Dropbox, it’s free and so far, trustworthy J I usually save to my computer, my laptop which is a Mac, and Dropbox, so I have 3 copies at least of my work. Join some critique groups, the more eyes on your work the better. Most of all do it because you love to write. If you’re getting into this for the money, there are easier ways. That’s a tough question. I have a couple automatic buys and they’re on opposite ends of the romance genres. Number one would have to go to Suzanne Brockmann. I have every book she’s ever written and re-read them every couple of years, yes, they’re that good J Almost from the first words on the page you’re drawn into the world of her characters. She’s so good at portraying realism into her heroes and heroines that the reader gets caught up in the life and death struggle of survival, as well as the hopes and dreams of a happy ever after. More than once I’ve lifted my head from one of her books and had to readjust to my surroundings. Now that’s good writing. I’d have to say characterization. If you can’t hook your readers into having empathy for your hero/heroine, or even for your antagonist, you have a problem. I think a writer needs to get into the head of their characters and show the reader their inner most fears and desires. Make us root for them. Secondly, I think setting is crucial. The reader needs to be able to picture the scene in their head for believability. As a writer it’s our job to point out different elements of a setting seen from the eyes of our characters. A man wouldn’t notice a crocheted doily on a table for instance, but the heroine might cherish it as an heirloom from her grandmother. 6. What comes first, the plot or characters? I think for me it would be the plot. I get an idea in my head, usually from news stories on TV, and then I do the ‘what if’ scenario. After that the characters form from within the plotline. 7. Tell us something about your newest release that is NOT in the blurb. When I was in school, I was the typical wallflower, slightly overweight, nerdy, loved reading. So when writing The Rebel’s Redemption I decided the perfect foil for Jared Martin’s outgoing, sarcastic nature would be me, J , kidding. Annie Campbell does have a lot of the same characteristics though. 8. Are you working on anything at the present you would like to tell us about? Currently, I’m working on book three in the Wounded Hearts series. Tentatively titled, Twilight Theatre, this is the story of a pair of star-crossed lovers, Ty Garrett and Katy Fowler. Ty and Katy were high school sweethearts but then life got in the way and tore them apart. Now, eight years later, Katy returns to Tidal Falls planning to get married in her family’s old business, the Twilight Theatre. The building is in need of restoration so Katy’s father hires the local expert, Ty Garrett. Dangerous mishaps begin to occur at the theatre. Can Katy and Ty put aside the past and work together to stay alive, or will it be too late? 10. 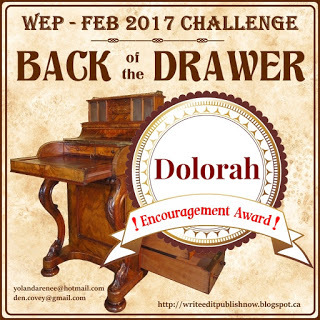 What books or authors have most influenced your own writing? I’d say Suzanne Brockmann, Iris Johansen, Elizabeth Lowell, J.R. Ward, Cherry Adair. They all have the ability to make the reader feel as if they’re part of the action. I love when you can get lost in a great book. 11. How do you come up with the titles to your books? That’s a good question. It doesn’t usually happen until I’m about two thirds of the way through the story. Then something just clicks and voila J Titles are so important. You need something halfway original, yet eye-catching, and it has to give a feel for the type of book the reader is opening. That’s a tall order. 12. What is the hardest part about writing for you? Staying vigilant and focused. I’m a horrible procrastinator. I start the morning with e-mails, which carries over into social media. Then I look at my advertising for the day. Then my blog, maybe some sales stats…yeah I can waste time like nobody’s business, lol. 13. What do you like to do when you are not writing? My favourite thing to do is going to the beach with DH. We lived in Northern Alberta for most of our lives. Winters there are long, cold, and dreary. A couple years ago we moved to coastal British Columbia to help take care of our grandson while our girl goes to university for Marine Biology. Best decision ever! Now my DH and I go out on dates to the beach. We stop by the coffee shop for a French Vanilla, and then away we go. It’s heaven on earth, truly. Food for the soul. 14. How many books have you written? Which is your favorite? I’ve written two so far, working on the third. I’m also going to be a part of two multi-author boxed sets this year, one releasing in June, Dangerous Encounters, and the other July, Hot Summer Nights, Vol 1. 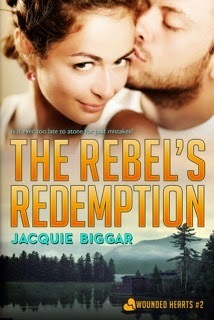 My favorite book so far would be The Rebel’s Redemption. I have a real soft spot for Jared. 15. Are you a plotter or a pantser? I’m a pantser all the way. I’ve been told numerous times if I would sit down and write an outline the story would move along much faster and that may be true—for them. I just wait until I get a thought in my head and start setting words to keyboard it works for me. 16. Where are you from, and what do you love best about your hometown? I’m from a small town in west-central Alberta, Canada. Our family was there for four generations so needless to say we were well-known members of the community. As a child the town was one of those you read about, where no one locks their doors and kids were safe in their neighborhoods. Then the oil boom hit and strangers moved in, the town suffered growing pains, and regretfully changed. 17. Ebook or print? And why? Both J Actually I have e-books for my regular reading and print for my keeper shelf—which is over-running my house! E-books are good because e-readers are light, compact, and most of all, multiple sized fonts. This granny needs larger words all the time, lol. 18. What are the best and worst pieces of writing advice you ever received? 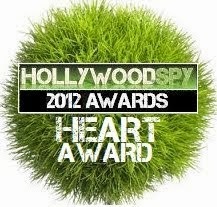 The best advice I’ve received is to join critique groups, get as many eyes on your work as possible before publishing. This is key in the editing process, I love my critique partners. Worst advice, funnily enough, came from some of these aforementioned groups. One would say change this, so I would. Another would say change that, so I did. Then came the second best advice, from my DH. He saw my frustrations, listened to my whining, then looked me in the eye and asked, “Whose book is this?” Trust yourself, no one knows your story better than you. 19. If you were stranded on a desert island and were only allowed to have five modern conveniences with you, what would they be? 20. What are your favorite TV shows? My current favorite is Blacklist. I love Redd’s character, James Spader is awesome. Annie Campbell's predictable and cozy life gets turned on its side when her son's prodigal father returns to town. Then an old enemy shows up and the outcome will not only place her in danger, but their son as well. Jared Martin left Tidal Falls a hotheaded youth, and has seen his share of violence in the eight years he’s served Uncle Sam. Floundering, he returns to his hometown to regain his bearings, bitter and disillusioned. Then he finds out he’s a father. When an old enemy follows and causes mayhem in the small town, can Jared overcome the odds to protect the woman he’s always loved and the child he never knew, or will it be too late? 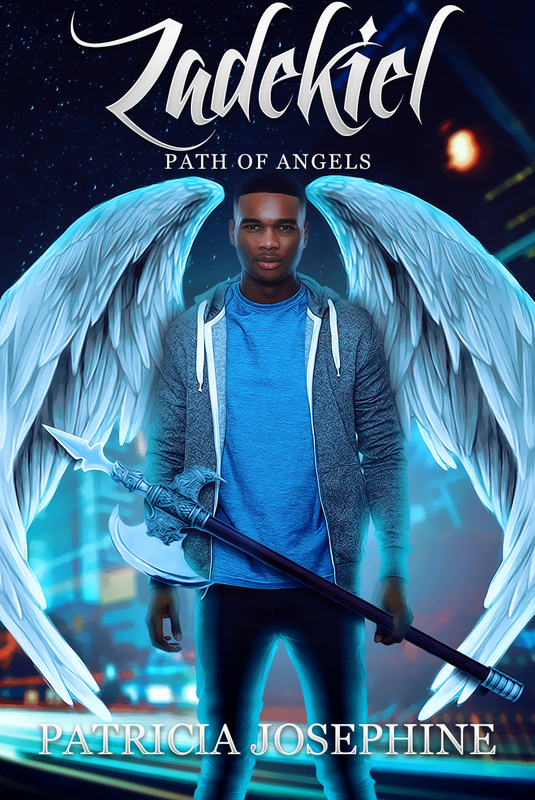 Please welcome Patricia Josephine to my blog as she discusses her latest book release Jophiel, in the PATH OF ANGELS series . . Honestly, fallen angels get a bad rep. They are easy bad guys. They did fall from grace after all, so it’s easy to make them embrace evil. 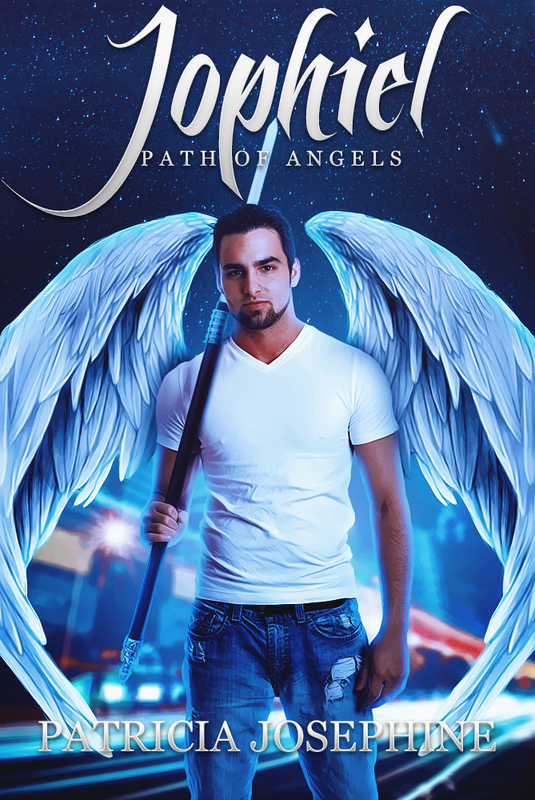 I found it easy to write my fallen angels as bad guys. A character’s name can be important. It’s not always random, like with Mariangela. A lone fallen angel trying to make things right. Her name is Italian and means bitter angel. Although, she isn’t really bitter and I can’t remember why, when I was writing the first draft, I chose it. That’s actually something she put behind herself. She had to forgive herself for what she did. Once she did that, she became the person you meet in the story. She’s kind and gentle, but determined. I think she is a strong woman. She’s not a fighter, but she will stand up and do what she believes is right. Sometimes there has to be a meaning behind the name. I had some conflicting information on Johpiel. A few sites he wasn’t listed as an archangel, then others said in Jewish lore it was the name of an archangel. Either way, I decided to keep the name. 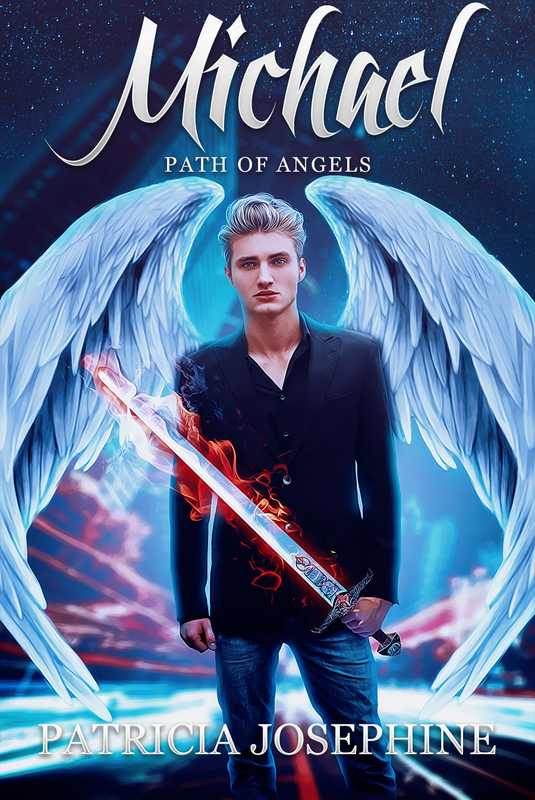 Some believe Johpiel to be an archangel. This angel inspires us toward awareness, enlightenment, open-mindedness and freedom of thought. He teaches our consciousness to discover the Light within. Joe is a huge joker, but knows when to be serious. Sometimes you wouldn't think he would be an archangel. 1––Let’s start with the basics. Tell us a bit about yourself and what makes you tick. Joe: Hi, my name is Joe and I’m an alcoholic. KIDDING! I shouldn’t joke about that. Especially for Zade’s sake. *Joe flops down on a couch, kicking his leg up on the coffee table* I’m the oldest of us four. The comedian. Don’t listen to Gabe. Nothing diffuses tension better than a joke. I do have a serious side to me. What we do is dangerous and one misstep could get us killed. I won’t risk my brothers. 2––Do you have any hobbies, favorite TV shows, books? Anything you fangirl/boy over? Joe: Call of Duty, but I don’t get to play it much. I guess I’m living in a video game in a way now. Not sure that’s better. Video games aren’t as life threatening. Unless you count, spending way too much time sitting and playing instead of moving. 3––What is one thing from your past you’re most proud of? Joe: Jumping off the church in my hometown and trying to fly. None of my brothers wanted to. They were content to stay on the ground. Come on, you have to be daring and willing to bust your leg. Joe: What about Pie with cake filling? You feeling me? Playstation 4 or Xbox 1or WiiU? Joe: Actually, I prefer fall. Not too hot, not too cold. Plus, there’s Halloween and I firmly believe you are never to big to play dress up. Especially when free candy is involved. Joe: Kittens all the way. Joe: Witches. They are much hotter than a corpse or fur ball. Wow, Joe is certainly an interesting character; and is Mariangela a balancing love interest? Guess we'll just have to read the book to find out! For the June 1 Battle of The Bands I gave some advice to all the Dads, Grads, and Grooms out there struggling their way out of the comfortable norms and into new roles of responsibility. Change is not easy, and it seems to hit men hardest in June. My advice was to RUN LIKE HELL (Pink Floyd, Off The Wall album). Many artists have covered this song in varying genre's from cello to heavy metal; but since Off The Wall is listed as heavy metal, I pitted two heavy metal bands against each other for the cover: all girl KITTIE against MASTERCASTLE (only the lead vocalist is a female). Both of these artists were new to me - I gave up listening to heavy rock a long time ago, and basically only listen when someone brings a group to my attention (normally through my kids) or I hear it in passing (radio, out partying). Ya'll know I like heavy metal rock, but maybe you did not know I'm not entirely a fan of "growling" and "screaming" through a song. At least, not through MOST of the song. So with the first few notes of Kittie's version, I almost did not post it at all. But it seemed unfair to post a cello or all disco version against Mastercastle - which I instantly liked. To be fair in my personal listening (last night, since this post is live on 6/7) and to not judge a band by just one song, I listened to several songs by Kittie. I went to Utube and found the full album SPIT by Kittie, and listened to it while prepping and cooking dinner. Steak, Alfredo pasta (Knorr pasta sides, no way I'd cook that from scratch), green salad. They were alright, I likely would not go out of my way to turn off the album, but I wasn't impressed much either. Most of the songs had the same heavy chords and screeching. The Oracle album was next on the autoplay, so I let it play as I sat down with my food. Trust me, not dinner music! I skipped past many minutes, and finally had to go find the Oracle album, see the titles, and play the songs individually. I love Morgan Lander's vocal range. Brackish was their first hit song, and has none of the signature growling. Give Morgan her props, she rivals Epica's Mark Jansen for metal growling; but dang can she hold a clean note when she wants to and give competition to Mastlecastle's Giorgia Gueglio. Safe and Pink Lemonade were the only songs on the Oracle album I listened to entirely. Completely shows off the band's talents. As you can guess, my vote goes to Mastercastle. I honestly did not expect Kittie to fare well in this match up. But I was pleasantly surprised that they went neck and neck through most of the voting. With all this write-up you're probably thinking Kittie won the battle. Final tally was Kittie 10, Mastercastle 12 (13 with my vote). Yeah, I could write an epic fantasy (short) story to this. 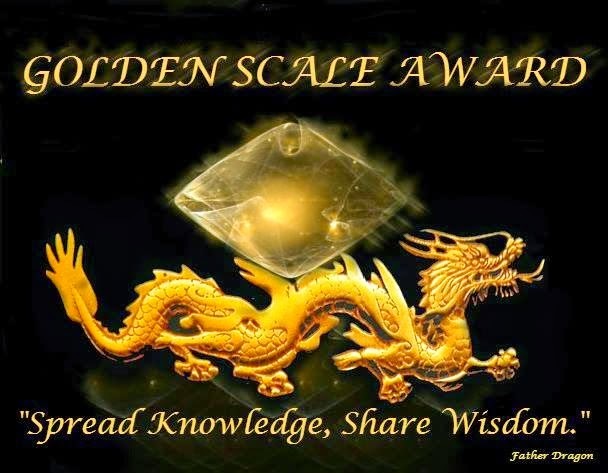 Thank you to all my IWSG commenters (and Gary) for your support, encouragement, and mostly, advice on plotting and research. Hurray for me; I have this shiny new idea for a story! About time. I love my new idea, even have a few lines written, and started some plotting. Yes, you heard that right from a pantster - I am doing some minimal plotting. Plotting of course, entails RESEARCH. I was over at M Pax site, and she posted about a dwarf galaxy that was being absorbed by the Milky Way, and that sparked a cool idea. 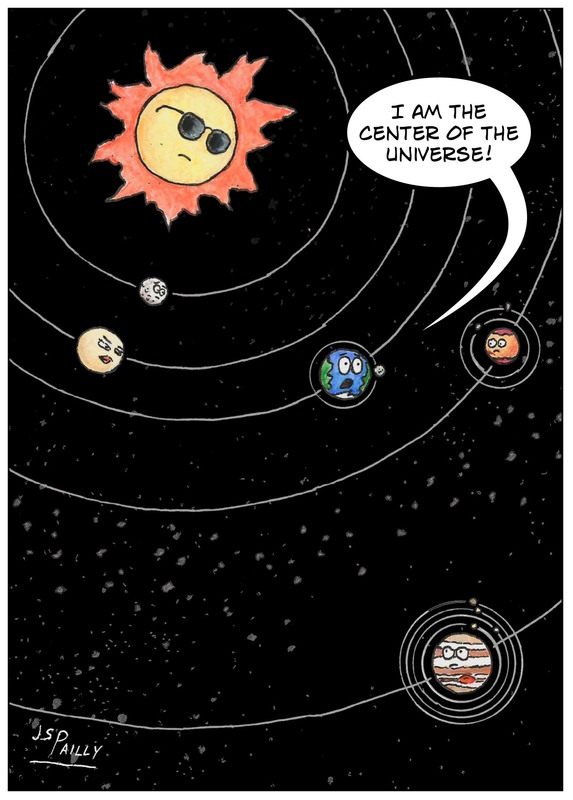 Except, I know nothing about science or astrology. For this idea I need to know some stuff about planets, and sustaining some type of humanoid life form without direct sunlight. I love research! Just give me an excuse and I will happily dive into research heaven for anything. ANYTHING. Following one link to another, thinking new what-if questions to answer. Getting lost in trivia for hours, days. The problem is that I am the queen of procrastination. And what better way to procrastinate than to conduct research for a shiny new story idea. I've had a couple story ideas that required lots of research, and I spent so much time researching, I forgot what I was going to use the research for; what the plot for the story should be. And while I am grateful for this shiny new idea, and the opportunity to increase my knowledge about an interesting subject I know very little about. This love of research, coupled with my inclination for procrastination, make me question if I want to write this story at all, or if I am just bored and want some reason to sit for hours on my computer and pretend to still be a writer. That is my insecurity this month; that my idea that needs lots of research is just a fleeting procrastination tactic to not complete any unfinished projects. Have you ever questioned a new story idea? Ya'll know the drill for Insecure Writers Support Group, and if not, visit the link for details, and of course for a list of participating blogs. Be sure to stop by Alex's co-hosts this month: M Pax, Tracy Jo, Patricia Lynne, Rachna Chhabria, Feather Stone and Randi Lee. I've got lots going on this week so I may not get around to much visiting until late this weekend. Well its June 1. June is a month for Dads, Grads and Grooms. Yep, seems a bad month for men of all ages. They are graduating, leaving behind the comfortable caretaking of Mom and learning to fend for themselves; taking the plunge into marriage, making the commitment to think of another before satisfying their own needs; or celebrating the joys (trials) of fatherhood, leaving behind the last vestige of their own childish nature. Or so all women hope. 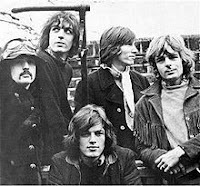 The concept behind Pink Floyd's RUN LIKE HELL song is that of the anti-hero. Naturally, anyone who has ever listened to a Pink Floyd song is groaning right now, complaining they do not have 8-10 minutes to spend listening to one of their songs, let alone two versions. 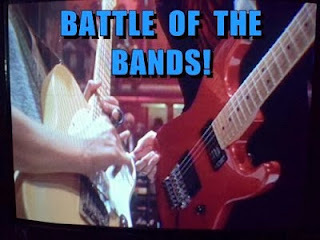 Lucky for you Pink's version is not on the voting docket for this Battle of the Bands installment. You can listen to the 1979 The Wall album version here if you are interested. I prefer the Pulse Live version, of course, but by that concert three of the original five members, including co-writer Roger Waters, were no longer performing members of the band..
Run, Run, Run, Run, Run, Run, Run, Run. Feel the bile rising from your guilty past. RUN LIKE HELL has been covered by Canadian heavy metal band Kittie (album Oracle); jam band The Disco Biscuits; violinist Andrej Kurti and cellist Victor Uzur (album The Entertainers); and Italian heavy metal band Mastercastle (album Last Desire). Mastercastle were founded in January 2008 by the guitar player Pier Gonella and the singer Giorgia Gueglio. The pair had several music projects in the past and wanted to try something different. No fixed genre was chosen with the emphasis being on producing music in a natural way. This post is part of the bi-monthly BATTLE OF THE BANDS blog hop hosted by Admiral Ninja Stephen T McCarthy and that rascally blond chick Far Away Series. Please leave a comment and vote for either Kittie or Mastercastle with a reason why you chose the contender, then bust out the Icky (Reno beer) and visit the list of participants here to view more battles or to post your own battle. No commitment, all newcomers are welcome. Pants and chipotle sauce optional.